Win a $50 Gift Certificate to Pizano’s! Congratulations to Pete Johnson on winning our sixth High Five Giveaway and thank you to all who entered! 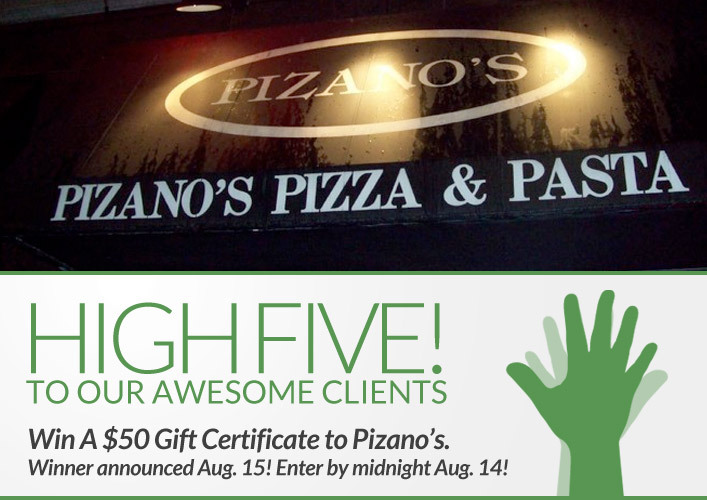 Our next High Five Giveaway is for a $50 gift certificate to Pizano’s Restaurant. We feature thin buttercrust and award-winning deep-dish pizzas, along with homemade pastas and sauces from recipes that have been passed down for generations. And beyond the menu, we offer friendly service in an inviting and comfortable atmosphere. Come experience Pizano’s and the old world tradition of great food and the celebration of family, friends, and life. Pizano’s has multiple locations in Chicago, including one at 864 N State Street and one at 61 E Madison Street. Visit their website at www.pizanoschicago.com for more locations and information. What is the French word meaning “To Sweep” that is also a hair coloring technique? Now, just add a comment to this post with the right answer to be eligible to win! The winner will be announced on Wednesday, August 15. Entries must be received by midnight on Tuesday, August 14.